I have installed the Windows 10 Insider Program. Everything works, except Apache. When I try to start it, it says that port 80 is blocked. Is there a way to unblock it or tell Apache to use another port instead? I was using Windows 7 before. I had trouble with port 80 with skype, but i have disabled it. disable it, or set it to "manual"
English name is: "World Wide Web Publishing Service"
This answer is intended as an addendum to the highest rated answer on this thread by paaacman. I just wanted to add some helpful detail for users like myself who don't know their way around Windows 10 as well. Windows 10 runs IIS (Internet Information Services, Microsoft's web server software) automatically during Startup on Port 80. In order to use Apache Server on that port, IIS must be stopped. paaacman's response refers to the IIS server as "W3SVC", or the "World Wide Web Publishing Service". I suppose that's because Windows 10 runs IIS as a service. In order to disable it or modify how the service runs, you need to know where to find "Services" in your system. 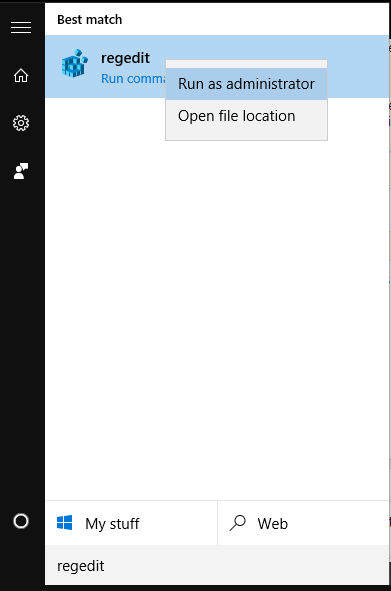 I found the easiest way there was to click on the search button next to the start menu button in the Windows 10 taskbar and type "Administrative Tools". You can either hit return or click on the "Administrative Tools" link that Windows finds for you. A control panel window will open with a list of tools. The one you want is "Services." Double-click it. Another window will open called "Services." Locate the one named "World Wide Web Publishing Service." Some other users in this thread have listed what it is called in other languages, if your list is not in English. If you only want to turn off the IIS server for this Windows session, but want it to run automatically again the next time you start up Windows, right-click "World Wide Web Publishing Service" and choose "Stop." The server will stop, and Port 80 will be freed up for Apache (or whatever else you want to use it for). 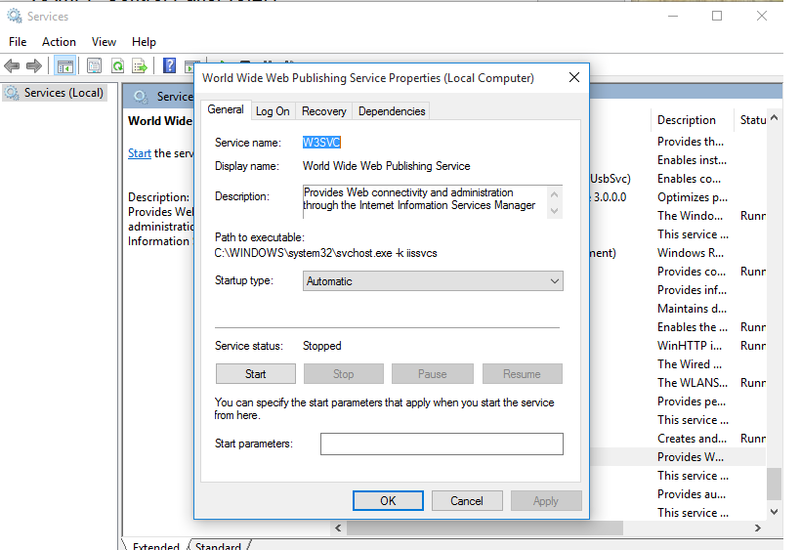 If you want to prevent the IIS server from running automatically when you start up Windows in the future, right-click "World Wide Web Publishing Serivce" and select "Properties." In the window that appears, locate the "Startup type" dropdown, and set it "Manual." Click "Apply" or "OK" to save your changes. You should be all set. Run appwiz.cpl use Turn Windows features on or off and install the IIS Manager Console. 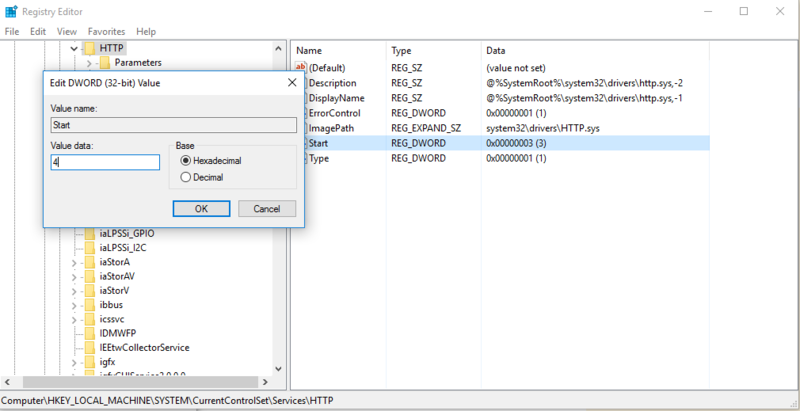 Run InetMgr.exe and go to "Connections -> Sites" and open with right-mouse click the context menu on the default entry "Default Website". In Context Menu select "Bindings" to open the Server address and port configuration. You may need to terminate SQL Server Reporting Services as well. Quit XAMPP Control Panel, then start it again and from "Action" start Apache & MySQL. Now you will see the port changed. 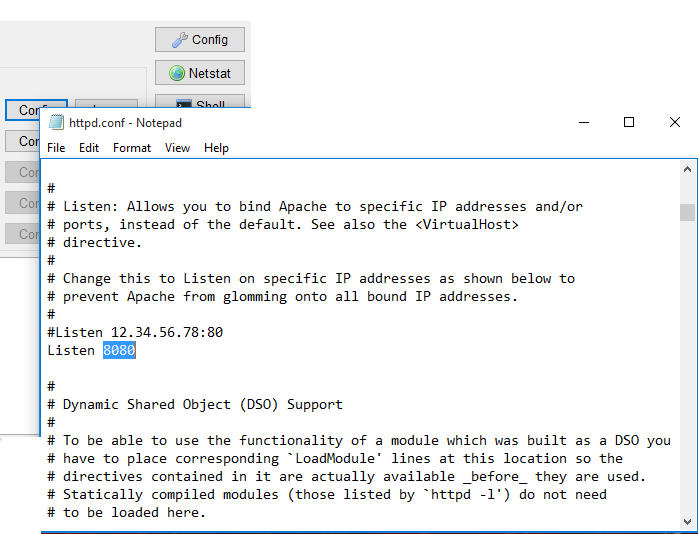 As you know now you have to get to your Apache server by using "localhost:8080" instead of "localhost". Also you have both Apache & IIS Express running in the same Windows 10 PC. I read a post some where were the writer suggested to use port "9080" but it did not work for me. The problem happens whenever a process uses port 80. You can run Netstat which is available in XAMPP Control Panel and check which process uses port 80 in your system. For me it wasn't IIS, but Skype. Turn off that process/application and then start the Apache services. I know that maybe this problem was resolved but I had the same problem with different solution. For that, I am going to explain another possible solution. In my case, the port 80 was occupied by Skype (pid: 25252) and I did not know what programme was. Other options with this command are here. I know this MIGHT not be the cause of your issue, but I've spent a few hours hitting my head against the wall to solve this issue and this is my solution. so my options were to either go through and edit all \xampp\apache references and point them at the right place, OR, the much simpler option... reinstall XAMPP at the root, so the references all point to the right place. A little annoying, but I guess that's what we get when Mac and Windows try to be friends..
Hope it helps a few of you. This fixed node.js not running on port 80 under Windows 10 as well, I was getting a listen eacces error. Start > Services, find "World Wide Web Publish Service" and disable it, exactly as paaacman described. I had the same issue and none of the above solutions worked for me. Apache uses both ports 80 and 443 (for HTTPS) and both must be ready to be used for Apache to start successfully. Only port 80 might not be enough. I found in my case that when running VMWare Workstation I had the port 443 used by the VMware sharing. You have to disable sharing in the VMware main Preferences or change the port in this section. After that as long as you have no other server hooked to the port 80 (see above solutions) then you should be able to start Apache or NGinx on XAMPP or any other Windows stack application. I hope this will help other users. While many are taking the approach to stop/disable IIS, it may be helpful to know that you can simply modify the XAMPP port, which has been answered here. This is the route I had to take as I need both running. Not the answer you're looking for? Browse other questions tagged apache connection webserver or ask your own question. How do I stop Skype from using HTTP or HTTPS ports 80 and 443? 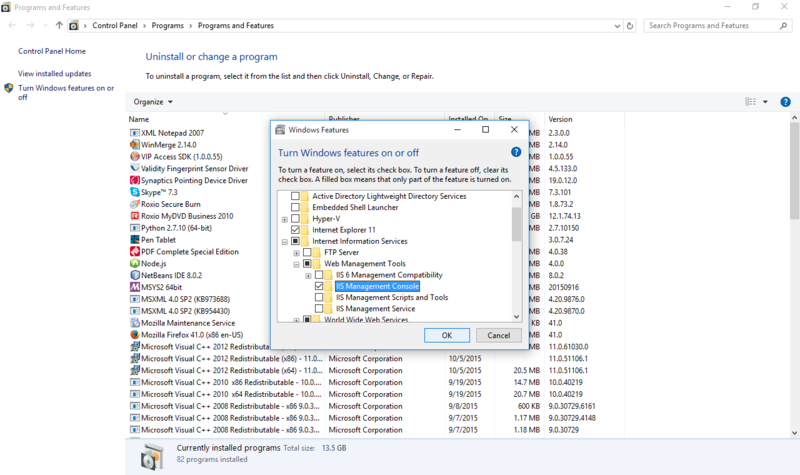 What program in Windows 10 uses port 80?